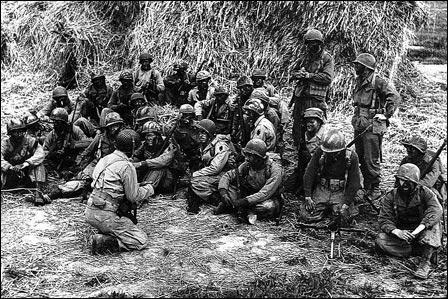 A platoon of the U.S.-Canadian First Special Service Force, "The Devil's Brigade," is briefed prior to going out on a nighttime raid during the Anzio beachhead in Italy on April 20, 1944 during World War II. John Tedore of Waterloo was a member of the force. Designed for play as Allied vs AI only. 7 mission Campaign. Semi-historical scenarios based on accounts of the First Special Service Force. The general history of the FSSF is well known thanks in part to Hollywood references to the unit (“Anzio”, “The Devil’s Brigade”, and “Inglorious Basterds” to name three). The true story of their service at Anzio is less well known. This highly trained and motivated U.S. Army unit contained a large number of Canadian Army volunteers in a unique bi-national program that produced one of the best pure light infantry units in history. Following their arrival in the Anzio bridgehead, they took over approximately 25% of the frontline, opposite Germany’s own elite Hermann Goering division. The two units settled into a period of positional warfare that lasted for several weeks. During this period, the FSSF put its light infantry skills to the test, and added to its reputation, particularly in its conduct on night patrols into enemy territory. This small campaign puts a CM player in command of a battalion of Forcemen in the bridgehead. While Combat Mission is most suited to portraying company-size battles – and the player can expect to fight those kind of actions in this campaign – it is hoped a small taste of the stealth and tension of night patrolling may also be gleaned from some of the actions in this campaign. Inspiration for the campaign came from ASL scenario A19 “Cat and Mouse”, which portrayed a number of randomly generated patrol scenarios. The linked scenario campaign concept of CMX2 seemed like a natural way to do something similar, and provide some continuity to these patrols. The difficulties the FSSF had in keeping its units up to strength provides an interesting backdrop to the missions as well as utilizing the “core unit” concept to its fullest. 1.1 – Thanks to RepsolCBR for posting on the forum. Certain support units got stripped out of the campaign during the final draft. This is the scenario designer’s fault, for which he apologizes. Version 1.1 has the correct demo, bazooka and other specialist teams added to the core units. For an extra challenge try the 1.0 version but probably not recommended….Apologies again, and my thanks for the feedback. 1.2 – Testing of Cat and Mouse 4 revealed a minor – read fatal – flaw in that the objective house could not be entered by friendly forces. This has been fixed, as has the Tactical Map briefing note that read “destroy” instead of “occupy.” This was correct in the objective label in-game as well as the scenario briefing. 3 Comments on "TWC Black Devils of Anzio"
Hmm. I seem to be unable to access this scenario. I have Gustav Line installed. I drop the .cam file into the “Campaigns” folder in CMFI. I just can’t access it when I load up the game. Other scenarios for CMFI that I drop in the “Scenarios” folder work fine. Is there a story in this campaign?